BORROW consists of fragments that are put together in a performative presentation based on different influences and backgrounds that led her to create Sisyphus, an ongoing research for a choreography piece, which focuses on the body as a container of memories and how the body can remember its movements that appeared when it was under the condition of shamanistic possession. The presentation will include demonstrations of movements and parts of Suryodarmo’s previous works, including EXERGIE – butter dance. Melati Suryodarmo’s performances have been dealing with the relationship between a human body, a culture in which it belongs to and a constellation where it lives. Through the presence, she compiles, extracts, conceptualized and translates some phenomenon or subjects into movement, actions, and gestures that are specified to her performance. 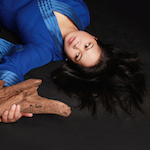 Melati Suryodarmo´s performances concern with cultural, social and political aspects, in which she articulates through her psychological and physical body. Her performances feature elements of physical presence and visual art to talk about identity, energy, politics and relationships between the body and its environments. Melati Suryodarmo studied at the Hochschule für Bildende Künste Braunschweig, Germany under Anzu Furukawa and Marina Abramovic. Suryodarmo has presented her works in various international festivals and exhibitions since 1996, including the 50th Venice Biennale 2003, Marking Territory, IMMA Dublin. In 2005, Melati Suryodarmo has performed at the Van Gogh Museum Amsterdam, during the Exhibition of the Life of Egon Schiele; Videobrasil Sao Paolo, and at Haus der Kulturen der Welt Berlin. She also performed at the 52nd Venice Biennale dance Festival (2007), KIASMA Helsinki (2007), Manifesta7, in Bolzano, Italy (2008), InTransit Festival, HKW Berlin (2009), Luminato Festival of the Arts, Toronto, 2012. Since the last six years, Suryodarmo has been presenting her works in Indonesia and other South East Asian countries. For the Padepokan Lemah Putih Solo Indonesia, she has been organizing an annual Performance Art Laboratory Project and “undisclosed territory” performance art event in Solo Indonesia since 2007.